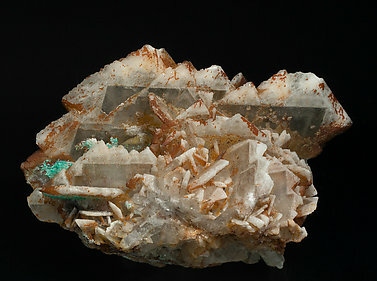 Platy growths showing the so-called sawtooth shape, of Baryte crystals with a very well marked geometrical color zoning, colorless and clear in the center and opaque white on the borders with reddish Hematite inclusions. 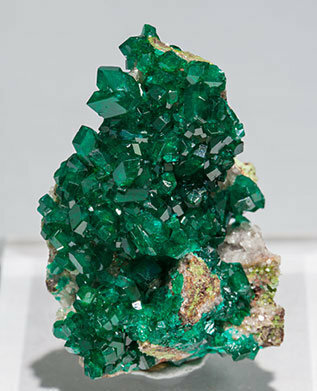 Some of the crystals are partially coated by small crystalline Dioptase. 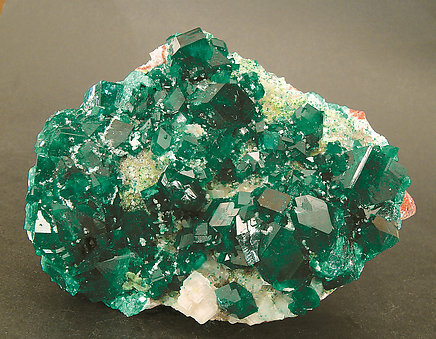 Aggregate of prismatic Dioptase crystals with acute rhombohedral terminations. They are translucent, very bright, and have a very deep and uniform color. We’ll send to the buyer the original label and also a copy of the computer card with the full text in the collection catalog. 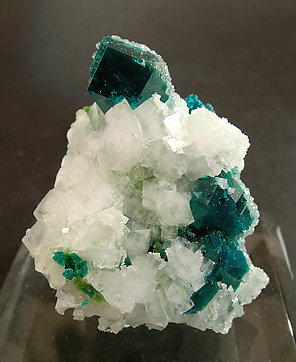 Aggregate of very elongated crystals that are transparent, very bright and have a very intense color. On matrix, with Calcite. We especially note the locality, very unusual for the species. Druse of rhombohedral crystals with very well defined faces and edges, extraordinarily bright and on matrix. Color and luster are magnificent. 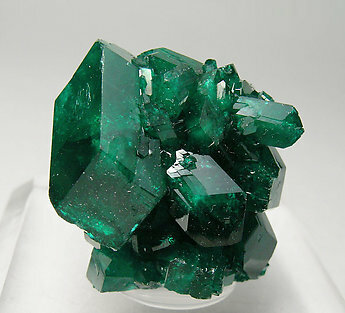 The group is formed by a lot of crystals with very well defined faces and edges and absolutely free of damage. The specimen, really esthetic, is from a recent find at a classic mine. The locality is uncommon. 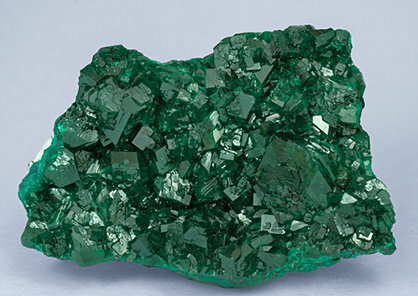 The group is consists of a lot of short prismatic crystals which have exceptional color and luster. It’s from a recent find in a forgotten place in which the former pieces hadn’t the same degree of quality. 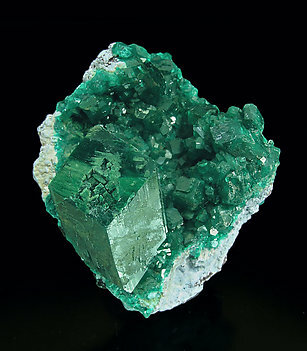 The main crystal, rising on a surface of smaller crystals, can be considered as a giant. 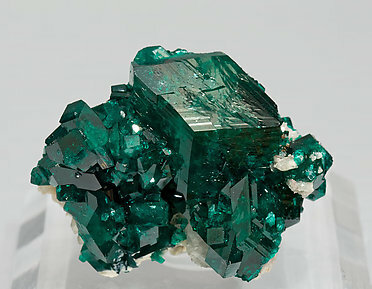 Its faces and edges are perfectly defined, bright and partially pseudomorphed by another (undetermined) copper mineral. 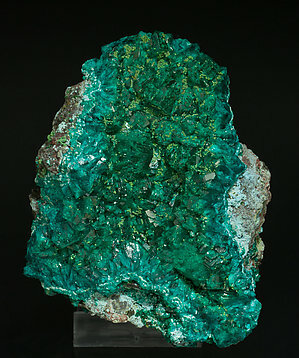 The matrix is a very rich blue mineral described as Chrysocolla on the label but it must be Plancheite. Please note that although the original labels state that the locality is "near Gouloukoutou River", we have labeled it as Tantara because we believe that this is the right locality. The sample is with two old labels, of Burminco (George Burnham) and from D.E. Boydston collection. Top quality specimen. 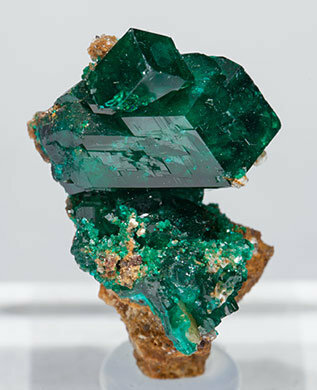 For its perfection, luster, crystal size, transparency, and contrast with its white Calcite matrix this Dioptase is a world class example of this very popular species. 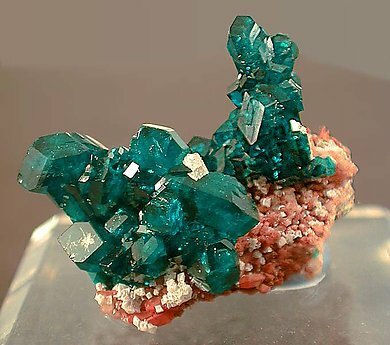 A sculptural esthetic and perfectly colored Dioptase on dolomite and calcite. An excellent specimen. 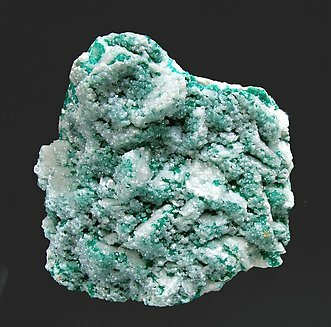 Attractive color and luster with an excellent disposition contrasting well with its white Calcite matrix. Group of crystals of a considerable size for the species. Some of them are doubly terminated and they all have very well defined faces and edges. Color and luster are excellent. 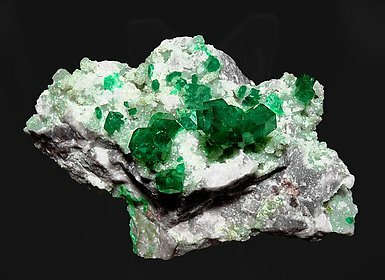 Magnificent group, on matrix, of sharp crystals, one of them clearly dominant and very large for the species. The crystals have very uniform and deep color and are very bright. Two single and isolated crystals, with a considerable length for the locality, partially doubly terminated, translucent, very bright and implanted on a matrix coated by Calcite. 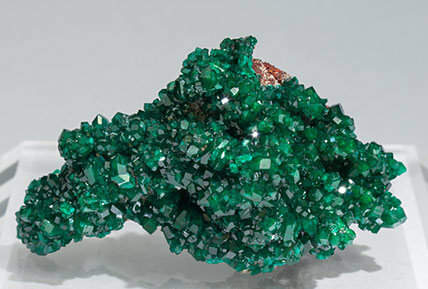 Undamaged crystals with a magnificent color and luster and some of them are doubly terminated. Beautifully positioned on a matrix of white Calcite, the piece is ideal for any collection. A great specimen. 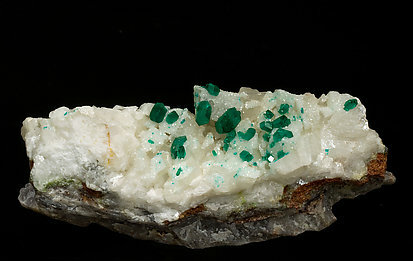 Dioptase crystals of a considerable size, on matrix, with very well defined faces and edges and partially coated by small botryoidal growths of yellowish-green Bayldonite. 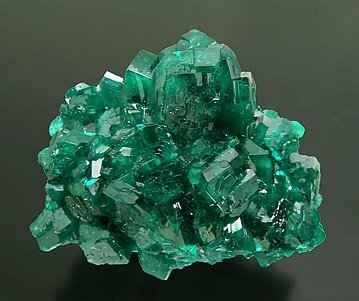 Aggregate of very well defined Dioptase crystals, a lot of them doubly terminated, very bright and on matrix, with small white Calcite crystals and clear green Duftite coatings. 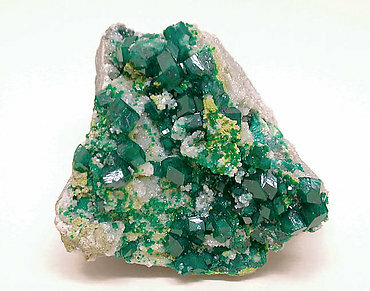 Very aerial aggregate of Dioptase crystals, one of them clearly dominant and doubly terminated. They are translucent, very bright and on a Calcite matrix. A perfect thumbnail. 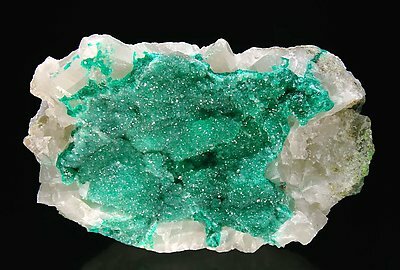 Aggregate of very well defined Dioptase crystals, a lot of them doubly terminated, very bright and on matrix. 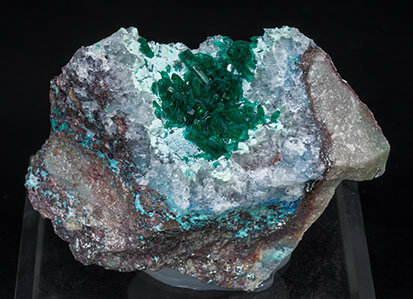 Small crystals of Dioptase with good luster and color, partially covered by Calcite micro-crystals and on matrix of Calcite rhombohedrons. 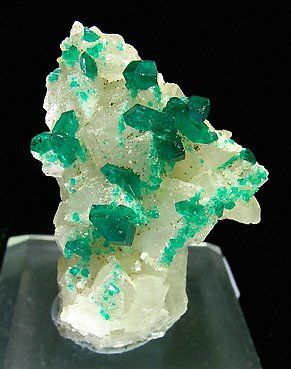 Layer of small but very bright and good color Dioptase crystals covering a white-yellowish rhombohedral Calcite matrix. 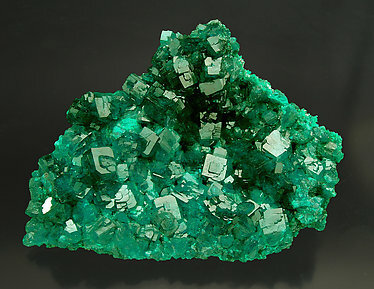 Doubly terminated crystals with very intense color and luster and on Calcite matrix. The sample is with a label that we'll send to the buyer. Small crystals formed by the prism and acute terminations of the rhombohedron, which selectively occupied the surface of some of the faces of the white rhombohedrons of Calcite. 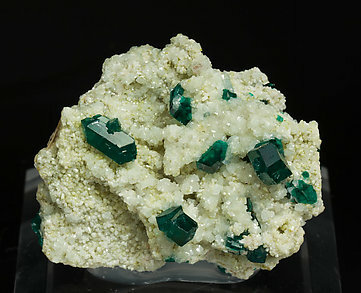 An attractive sample with a lot of doubly terminated crystals, bright and with a magnificent color contrasting with the matrix of white Dolomite. 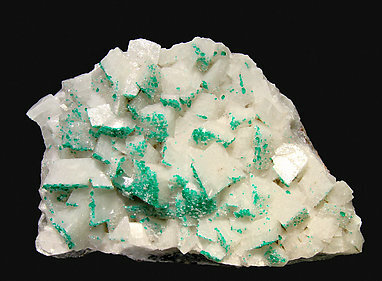 Very well defined crystals with perfect color and luster, partially covered by Calcite on a matrix of crystallized Dolomite. 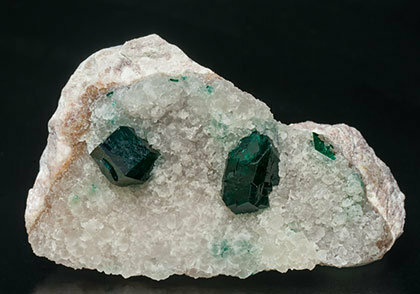 Isolated doubly terminated Dioptase crystals on a matrix of small white rhombohedral Calcite crystals. 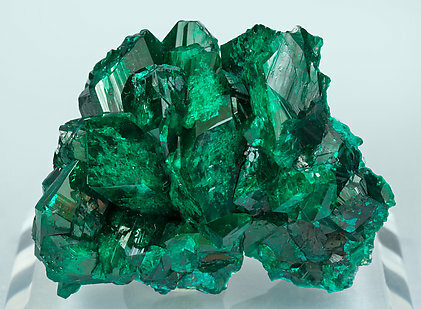 The Dioptase crystals are very sharp, transparent and bright.